This Sunday is the Feast of Dedication of the Basilica of St. John Latern. The readings can be found here. In the U.S., we just completed another divisive set of mid-term elections. Even within the Catholic Church should ideally would be a bastion of unity in Christ there are public criticism of Pope Francis. This Feast provides an opportunity to reflect on the meaning of unity of both the whole Church as well as humankind as a whole. “The first church building on this site was built in the 4th century when the Emperor Constantine gave land he had received from the wealthy Lateran family. That church and others which replaced it suffered over the centuries from fire, earthquakes and war but it remained the church where popes were consecrated until they returned from exile in Avignon, in the south of France. When the Avignon papacy formally ended and the Pope could return to Rome, the Lateran Palace and the basilica were in a serious state of disrepair. 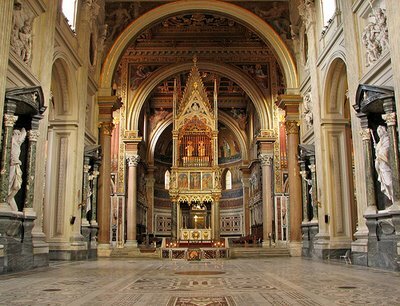 The popes took up residency at the Basilica of St Mary in Trastevere and later at the Basilica of Saint Mary Major. Eventually, the Palace of the Vatican was constructed and has been the pope’s residence until now. The present Lateran basilica was erected in 1646. It ranks first among the four major basilicas in Rome (with St Peter’s, St Mary Major’s and St Paul’s Outside the Walls) as the Ecumenical Mother Church. On top of its facade are 15 large statues representing Christ, John the Baptist, John the Evangelist and 12 Doctors of the Church. Underneath its high altar are the remains of a small wooden table on which tradition claims St Peter celebrated the Eucharist. St. John Baptist and St. John the Evangelist are regarded as co-patrons of the cathedral, the chief patron being Christ the Saviour himself, as the inscription at the entrance of the Basilica indicates, and as is the tradition in the patriarchal cathedrals. The Basilica remains dedicated to the Saviour, and its titular feast is the Transfiguration. Its full title then is Archbasilica of the Most Holy Saviour and of Sts. John Baptist and John Evangelist in the Lateran. This entry was posted in Sunday Reflections and tagged Catholic, Christ, Christian, Constantine, Feast of Dedication of the Basilica of St John Lateran, Jesus, Lateran Palace, Noosphere, Omega Point, Pope, Pope Benedict XVI, Pope Francis, Roman Empire, Rome, St. John Lateran, Sunday Gospel, Sunday Readings, Sunday Reflection, Unity. Bookmark the permalink. Having had the good fortune to have visited the Basilica, I can say that it is a marvel of man’s skill and craftsmanship–built during a time of limited technologies and engineering, yet is indeed a wonder. It is one of my favorite places in Rome—unlike St Peter’s often circus like atmosphere, there is a great sense of peace and reverence in St John’s as it does not see the same crowd mania as does the Vatican. It is important, especially for Christians (Catholic, Orthodox and Protestant) that as we ask our leaders and respective political parties, with their deep divisions, to come together on the grounds of mutual respect, cooperation and understanding as they attempt to find the balance for our Country, that the faithful, though divided by matters of doctrine, unite in common goals as well—the demonstrated compassion for one another as we continue the charges of Crirst—to minister to the sick, to clothe and house the naked and homeless, to feed the poor. . . Thank you for your wonderful comments, both on the message of Unity and your impressions of the Basilica. I have only been to Rome once and have not had the opportunity to visit it. It is definitely on my list the next time I visit.